“Instead of one day of presents / we have eight crazy nights,” sings Adam Sandler, and “So when you feel like the only kid in town without a Christmas tree.” He illustrates the pattern quite nicely. Even in jest, even in the Jewish imagination, commercialism and consumerism have turned Hanukkah into a shadow-holiday of its Christian calendrical cousin, Christmas. In medieval Europe, however, this was not so. Hanukkah was a minor holiday then, as now, but a minor holiday that needed celebrating. Its model or partner for how was no Christian feast but a perennial Jewish favorite: Purim. Purim, of course, is the festival celebrating the victory of Esther and Mordecai over the evil Haman recounted in the biblical book of Esther. Hanukkah similarly celebrates an event described in one of the Books of Maccabees—but that’s not how medieval Jews saw it! Instead, they partnered Hanukkah with the story of Judith in her deuterocanonical biblical book. Esther’s bravery helped thwart Haman’s plan to destroy the Jews; Judith snuck into Holofernes’ tent and hacked off his head with a sword. There was a certain symmetry to the medieval Jewish mind, apparently, that wanted to balance Esther with Judith and Purim with a Judith-holiday. The chosen candidate was Hanukkah. In other words, it was important enough to celebrate Hanukkah, like Purim, by eating and drinking and feasting, to delay the completion of penance! This decision, you might agree, was only fair. A holiday centered on food and feasting was a holiday predicated on food preparation. So while Purim and Hanukkah in the Middle Ages already focused attention on two stellar women of Jewish history, Esther and Judith, the mode of celebration centered on the efforts of contemporary Jewish women as well! Both texts, furthermore, indicate particular kinds of food associated with the celebration of Hanukkah, including pan-fried cakes and honey porridge. And while “tradition” with religious holidays so often dates back only decades or a century, there’s one Hanukkah-associated food that has not just its origins in the Middle Ages, but specifically medieval Hanukkah origins: cheese. [Judith] gave the chief enemy cheese to eat to make him drunk and they cut off his head and everyone fled. Because of this there is a custom to eat cheese on Hanukkah. Not only is the custom of eating cheese tied to the association of Hanukkah with Judith, not the actual origins with the Maccabean revolt, but it is tied specifically to the medieval legendary version recorded in the Megillat Yehudit. Biblical Judith feeds Holofernes no cheese. Megillat Yehudit feeds him several foods, including cheese and the levivot fried dish mentioned by Kalonymos, that recall the deeds of other biblical heroes—most notably fellow victorious woman warrior Jael, who drove a tent post into Sisera. 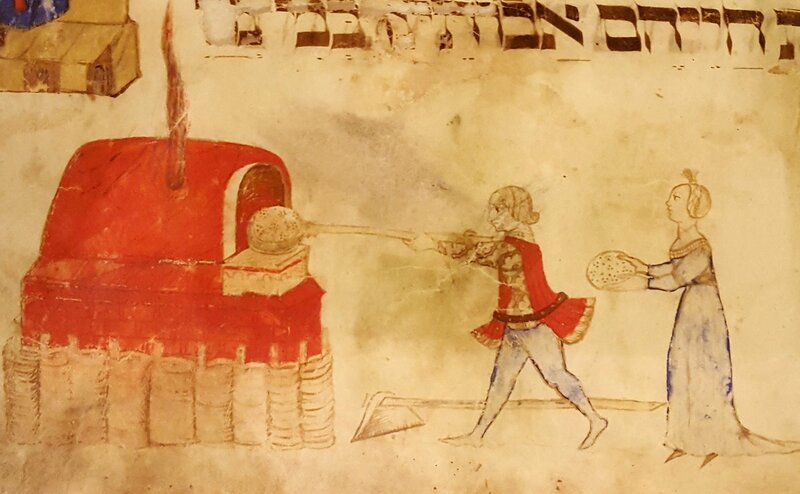 So, as Adam Sandler encourages us, it’s more than fitting that you “tell your friend Veronica / it’s time to celebrate Hanukkah.” In remembrance and in preparation, medieval Hanukkah seems to have been a surprisingly women-oriented or women-involved holiday in a overwhelmingly patriarchal calendar of them.